For questions about the Undergraduate Student Success Center, please contact Melissa Pierson, Assistant Vice Provost for Undergraduate Student Success at mpierson@central.uh.edu. Exploratory Studies is a re-envisioned preparatory major designed to provide undeclared students with resources to guide them in making confident, informed career and academic decisions. Exploratory Studies intentionally integrates academic support with career counseling toward the goal of transitioning students to a good fit major in which they will thrive and advance to graduation in a timely manner. 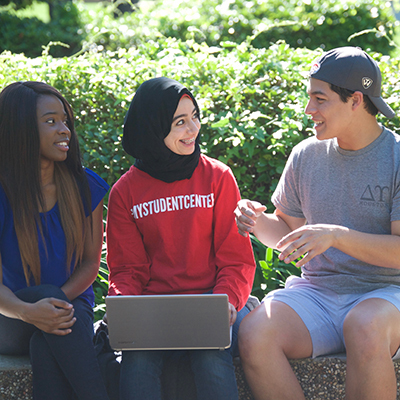 LAUNCH (Learning Advancements for UNdergraduate Cougars of Houston) lets your success take off, with Peer Tutoring for almost 500 separate courses, Success Workshops, and Individual Academic Counseling. The Challenger Program supports first generation college students through specialized programming and campus-wide resource connections.